Those with an eye for design, creative skills, and a strong work ethic may excel as an architect. Architects design buildings to meet their clients’ needs and use advanced software and other tools to create 3D renderings for construction. Online architectural degree programs prepare students to obtain state licensure and, in many cases, gain necessary work experience to enter the job market. This guide explains the path to success in this growing industry and online degree programs that open the door for aspiring architects. Earning a degree in architecture in an online format is a highly beneficial option for students interested in learning more about the built environment, but feel attending traditional in-person courses would be too time consuming. Online learning provides students with the same quality education, but without the hassle of organizing your schedule around set class times. 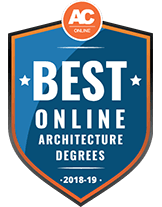 Because the process of finding which college would be best fitting to your career goals can be tedious and frustrating, we’ve put together a list of the best online architecture degrees offered around the country. Look below to find the top architecture programs for 2018-19. Nash Community College offers an online Associate degree in Architectural Technology for distance learners. Students take courses such as College Trigonometry, Residential Architecture Technology, Site Planning, Building Codes and Environmental Systems to prepare for a variety of careers in architecture or an associated profession. Students need to complete a total of 74-76 credit hours for graduation. For those students who can take classes full time, NCC recommends a 5-semester curriculum starting in the fall. Part-time students can enroll in 8-semester and 11-semester formats to accommodate a busy schedule. The bureau of labor statistics provides the following data about job growth in the field of Architecture. As well as the following national median salary data for several different careers in the field of Architecture. Licensed Architect Develops building and site plans for clients and consults with engineers and other architects to complete a project. $74,520 Bachelor’s degree and state licensure. Architectural Intern Assists licensed architects during the planning and development phase. $41,167 Bachelor’s degree and state licensure. Project Architect In charge of product design, planning, and consulting with construction experts. $63,736 Bachelor’s degree and state licensure. Excelled in math and physics with a special interest in art and design. Completed 5-year Bachelor of Architecture program at an accredited school. Online architecture degree programs are typically broken down into two components: theory and practice. Theory courses are centered on basic design principles, history of architecture, and an introduction to different types of technology and tools used in the field. The practice component typically includes a design studio where students walk through the design process and receive feedback from instructors and students on their projects. Many online degree programs require students to participate in online webinars and conferences. These online meetings make it easier to interact with other students and instructors in real-time and helps to round out the learning experience. Online students may be required to log in to a dashboard or online blackboard throughout the week to review assignments, download lectures and other materials, participate in discussion threads in an online forum, and submit assignments or quizzes. A week-long residence or weekly attendance at campus allows students to connect with faculty members in person and complete hands-on projects. Campus-based requirements vary by school but are a necessary component of architecture programs at all levels because they give students a chance to obtain practical, hands-on experience before seeking out an internship or job after graduation. To obtain further skills in this field beyond the scope of an online program, students are encouraged enroll in the Intern Development Program (IDP) from the National Council of Architectural Registration Boards (NCARB). This program provides a comprehensive experience by covering pre-design, design project management, and practice management principles and processes, and giving students a chance to work through various experience settings. Aspiring architects have the option to complete an accredited online degree program instead of traditional school. These programs provide students with a part-time or full-time job, family obligations, or other personal responsibilities the opportunity to complete their degree without compromising their daily schedule. Students can study on their own time and submit assignments through an online dashboard. However, hands-on training—a necessary part of any architectural degree program—must be completed on campus or in a similar setting since students may be required to use Computer Aided Design (CAD) software and other essential job tools not available in their homes. The Bachelor of Architecture (BArch) is a five-year program that encompasses general university studies and architectural courses. The first two years typically cover foundational courses in architecture and the remainder of the program is centered on integrative studies with applications in the field. The final year typically includes a design studio project where the student works through the entire design and development process of a building and presents it to a faculty member or board for review. Courses may include the history of architecture, design of building structures, architectural technology, fundamentals of design communication, and contemporary issues in architecture. Students can complete a Master of Arts (MA) in Architecture, a Master of Science (MS) in Architecture or a Master of Architecture (MArch) professional degree program in one to five years after obtaining a bachelor’s degree. These comprehensive programs prepare students for a successful career in architecture with advanced design studio practice centered around investigative processes in architectural designs and site planning, global urbanism, contemporary issues in architectural practice, and an independent design research project. Many distance degree programs at this level include a residency component, a multi-day or multi-week intensive that gives students a chance to work one-on-one with instructors and design professionals on a collaborative project, network with classmates and instructors, and participate in smaller learning groups. Outside of fulfilling residency requirements, students may be required to log in to an online dashboard for weekly assignments, quizzes, and online tests or exams. Some programs include online webinars and lectures, online meeting participation, and discussion groups. Those who wish to pursue research studies or teach can complete a Ph.D. in Architecture. 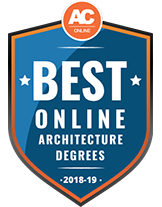 The Doctor of Architecture program typically requires a pre-professional undergraduate degree in architecture and some schools offer programs delivered 100 percent online. Courses focus on training the individual to be a scholar in the field of architecture and develop theories of their own. The program may include more in-depth study of the history and theory of modern and contemporary architecture. The Ph.D. dissertation requires submitting a proposal, obtaining a sponsor, and then, after a successful defense of the dissertation proposal, pursuing a research topic independently. Architectural degree graduates who wish to increase their skillset and knowledge in their field or complete specialized training can take continuing education courses at any time. These are non-credit enrichment programs that give students a chance to advance in their careers and fulfill membership requirements for The American Institute of Architects (AIA). Many of these courses can be completed online and may encompass topics such as: building science and performance, design services, project management, sustainable design, and architectural insights. Fundamentals of structural behavior and overview of different types of materials and strengths used in various types of buildings. May include an analysis of simple structural systems. Advanced courses may cover the design and function of different types of frames, walls, cables, arches, domes, and shells. In-depth understanding of building construction and materials and method used to create different types of buildings and spaces. May include introduction to technical documentation and building service systems. Organizational and management best practices and theories for delivering design services as a licensed architect. May include an overview of the profession and study of an architect’s professional job responsibilities and skill set requirements for all phases of the design and development process. An advanced course that introduces students to the investigative process and themes of inquiry in the field of architecture. May include an overview of common problems and solutions developed by architects over the course of history. Overview of the principles of design related to the environment and site planning processes. May encompass different types of foundations for various climates and environments, surfaces, and construction techniques for various outdoor environments. Decide which degree type suits complements the student’s career goals, availability, and learning style. Review instructors’ credentials and background in the field of architecture. Make sure you meet GPA and other enrollment requirements. Confirm the school is accredited by the National Architectural Accrediting Board (NAAB). Determine whether career placement services, internship opportunities, and on-campus services are available for online students. Learn about hardware and software requirements for online students, such as CAD programs, for example. Determine whether the online school accepts transfer courses from another educational institution. Students need to enroll in an online degree program that is accredited by the National Architectural Accrediting Board (NAAB). NAAB accreditation means the program meets the Student Performance Criteria, a set of established expectations of all architecture graduates in the United States. It is the only authorized accrediting organization in the United States for degree programs in architecture. All NAAB-accredited programs have similar curriculums and prepare students to satisfy Student Performance Criteria to earn their degree and then obtain certification from the National Council of Architectural Registration Boards (NCARB). Students can rest assured that enrolling in an online program with this accreditation status will provide them with the same education as on-campus programs. Getting started with the Intern Development Program after high school graduation. Students need to establish an NCARB record, identify an IDP supervisor, find a licensed architect to be a mentor, and document their experience through the online reporting system. Joining a networking or professional organization in the field of architecture can help students and graduates make connections as they advance in their careers. Some of the industry’s primary organizations include, the American Architectural Foundation, The American Institute of Architecture Students, The Rice Design Alliance, and the National Association of Women in Construction. Completing self-study courses for professional development, such as those offered by MIT. Licensed architects across all fields are responsible for developing construction plans based on a client’s needs, drafting renderings of a building or structure, and using specialized software and tools to create 3D designs and site plans. They may work independently or as a team to create a blueprint for construction teams. Senior-level positions may lead a team of architects, engineers, and other professionals involved in the design, development, and construction phases of a project. Some licensed architects and design professionals work for architectural firms while others work independently to offer design services to clients. Demand for architects is expected to grow 7 percent through 2024, according to the Bureau of Labor Statistics, with a growing need for architects with advanced knowledge in ‘green building’ design, sustainable design, and eco-friendly design practices. All architects must be licensed in order to practice in their state. Even though a formal architecture degree is not required in order to obtain a license, most architects do complete this step in order to fulfill entry-level position requirements and advance in their careers. Almost all employers require at least a bachelor’s degree and state licensure as a basic job requirement. All state architectural registration boards require students to obtain a license before they can practice. They must complete at least three years of a paid internship before they can pass the Architect Registration Examination for licensure. The National Council of Architectural Registration Boards (NCARB) provides information on thestate registration licensing requirements. This is an optional certification for those interested in earning licensure in their state and becoming more marketable to employers. According to the Bureau of Labor Statistics, approximately one-third of all licensed architects were NCARB-certified in 2014. The American Planning Association is a professional institute that certifies professional planners. AICP certification can enhance the architect’s credibility in their field and may help them advance in their careers when pursuing project management and planning job opportunities. Those interested in designing only outdoor spaces to complement a building can complete this degree program that focuses heavily on designing structures such as parks, waterfronts, plazas, and similar areas. The dynamic and ever-evolving field of fashion and retail requires the skills of someone with a strong eye for design, fashion trends, and thorough understanding of consumer behavior and retail management. Individuals enrolled in this degree program study principles of retail store design, fashion marketing, color theory, and consumer behavior. Individuals with a passion for the history of art and design may excel in an art history degree program that encompasses a variety of courses related to aesthetic trends and developments around the world. Courses examine art history from different cultures and prepare students for a career in commercial art galleries, museums, or for an art publication.